Holding courses is one thing, finding out if the work is another. As well as using our Care2Share scheme, designed to give the young people who take part a far greater say in what we do, the comments below also include feedback from our end of course reviews and evaluations. All in all the holiday was fantastic. I hope we get to come back again. The difference it has made for the children has been incredible. As a previous young carer I know what a difference a break from home can make. Especially when some families can never afford holidays. Eight years on from my own Raasay experience I can truly say it is an experience the children will never forget. Overall a very enjoyable experience for myself and the group would love to come back. All kids and workers had a brilliant time and got a lot out of it.Thank you! The whole week was absolutely amazing and after two days the kids wanted to organise next year.Everything was fantastic.Well done to all the staff and instructors and a big thank you. A very pleasant stay overall and the groups really enjoyed it, as did myself and colleagues.Would be happy to recommend to other projects and would happily come back. Had a great time and would like to thank all the staff. Thank you for having us! It has been a pleasure. This trip is truly a once in a lifetime experience and guaranteed to be held in a special place in all of the hearts of the young people fortunate to have this experience.So a massive thanks to all who make this trip possible, the difference it has made to the young people I have brought is immense and immeasurable.The smiles on their faces really says it all. My first time here with a group and I found it an excellent experience in a beautiful place. Been great for building relationships with young people + staff + instructors. Given opportunity for confidence building and learning new skills. Provided opportunity for young people to have a break in a safe and secure setting, and be/feel supported by staff + instructors. Young people developed new friends + build on existing ones. Break from home, fresh air, good food, no wifi and limited phone signal benefitted them greatly. It gave them the ability to try new things, to challenge themselves. Also it let them meet new people and mix as a group. It helps with their confidence, people skills, and general behaviour as part of a group. It’s also just really amazing for the group to see their country and the setting was amazing for that. It gave the youth opportunities to do activities that they wouldn’t have the chance to do at home. Meeting new people from different projects and areas with the chance of making new friends. Also the chance to overcome fears and experience living without the comforts of home. i.e. being without tv, computer etc. The course has offered our young people the opportunity to see new sights/surroundings that they never had before. The course has helped them with dealing with new challenges, make new friendships and have to try and work out if these friendships are not suitable in the long term! The course has enabled the young people to have the respite they need from their caring roles, be supported to manage any anxieties that this may produce and from this add more skills to ensure they can managed any anxieties they suffer with, better in the future. Then we asked "What activities/sessions worked well?" All outdoor activities well organised by instructors. Raft building was very enjoyable and fun. Instructors were great at thinking on their feet and making last minute changes to programmes which helped ensure the programme ran smoothly. All of the tutor activities – sports worked fantastic – very experienced out door instructors. All activities worked well but there wasn’t much to do in the evenings or wet days. The gorge walk was pretty high on the list. They also really enjoyed the canoeing and crate building. The team activities where they were all involved really worked. A few of the boys really enjoyed the walks, purely for the scenery and relaxed vibe of the instructors. 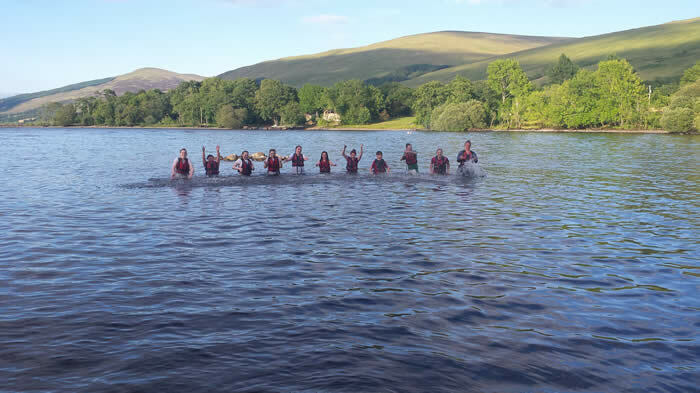 Swimming on the last night, Gorge walking. Adventure day. Change of plans for the weather- staff were very flexible and delivered a great alternative to planned activities. Centre staff were friendly, passionate, caring and kind towards staff and young people. They took on all the activities with a huge amount of energy and promoted positive relationships throughout. The kitchen staff nurtured young people in making choices about food and encouraged them to be involved. Fantastic centre staff, brilliant ethos and positive atmosphere. Fantastic, all amazing, adaptable, eager to please, approachable, keen + kind. The staff were amazing. The kitchen staff were brilliant and always made sure everyone was fed and happy. Really nice team! The activity instructors were brilliant as well. They never talked down to the group, and always encouraged them without ever pushing them. The group spoke very highly of the instructors in general. All of the staff were first class. Really helpful and couldn’t do enough to make the experience for the youth an amazing one. Well done to all. Brilliant attitude for the young people on the whole. Felt YP were in safe hands during activities. The staff at the centre were great! All the leaders on the activities were fantastic! They showed a good level of patience, humour and seemed to have a great understanding of the young carer’s situations (levels of concentration/ focus). The staff who were part of the catering, or the admin/office staffs were brilliant with all our young people. We also wanted to know about the accommodation and catering. Accommodation + catering were both great. Accommodation was clean and food catered for variety and tastes. Portions in first night were not big enough but catering took this on board and made sure this was improved for the second evening onwards. Fantastic – catered to all our needs – dietary requirements plenty of well cooked food – perfect. Accommodation is great. The space was amazing! There was a perfect balance of quiet and busy areas. Plenty of places the group could go to chill out, as they’re a bit older it really worked. The bedrooms were a bit small, but there were plenty of lovely hot showers. The food was amazing. There was always laughter and plenty of it. The groups all ate really well, and the juice and fruit were always there. Flawless! Every aspect of the trip was just fantastic and the food couldn’t be faulted. 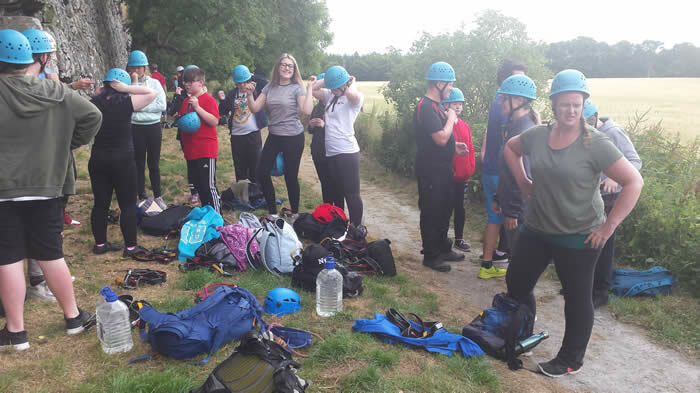 Space worked really well for this group – enough freedom for the YP to feel able to explore and be at home, whilst being safe and in sight of leaders if required. Catering was amazing – brilliant menu and good at being flexible & accommodating to requirements. Hope to return, and after all was a happy and peaceful atmosphere, also a massive thank you to the instructors for helping me improve my frame . THE STAFF IS AMAZING, HUGS FOR ALL! It was wonderful. Friends were nice. View was perfect. Thank you for helping me over come my height fear and gorge grableing was amazing. You guys were so supportive and kind and caring. Was happy I came and you all you are AWESOME! Personally just want to say thank you for all the help and support over this whole week.We have all had an amazing time and we will take memories that we have made with us as well as all the new friends we will stay in contact with. It was a really nice place, worth the 11 hour ride here, everyone was really nice and a big thank you to everyone for everything! It’s been a really nice break for me thank you.This place is amazing. Everyone was really nice! Would come back every year. The whole experience was life changing, if I didn’t like activities they would let me improvise and let me rock jump instead of coasteering. But, at the same time, the staff always made me feel safe and motivated and the kitchen cooked something else if I never like the meal.Thank you. Through C&T's involvement with the John Muir Discovery Award hundreds of young people, from very many different backgrounds and circumstances, have had the chance to not only discover a wild place but, to explore it, do their bit to conserve it and share the experience with others.